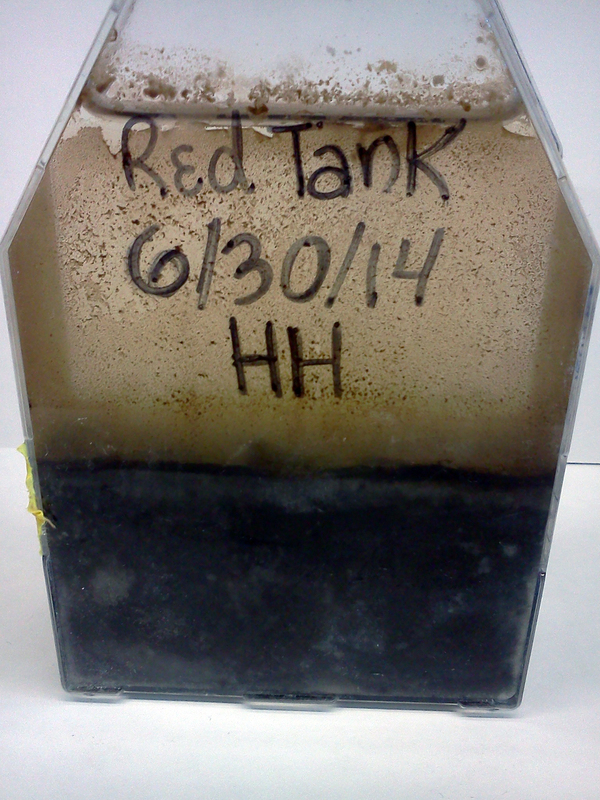 It is time again for a Winogradsky column update! 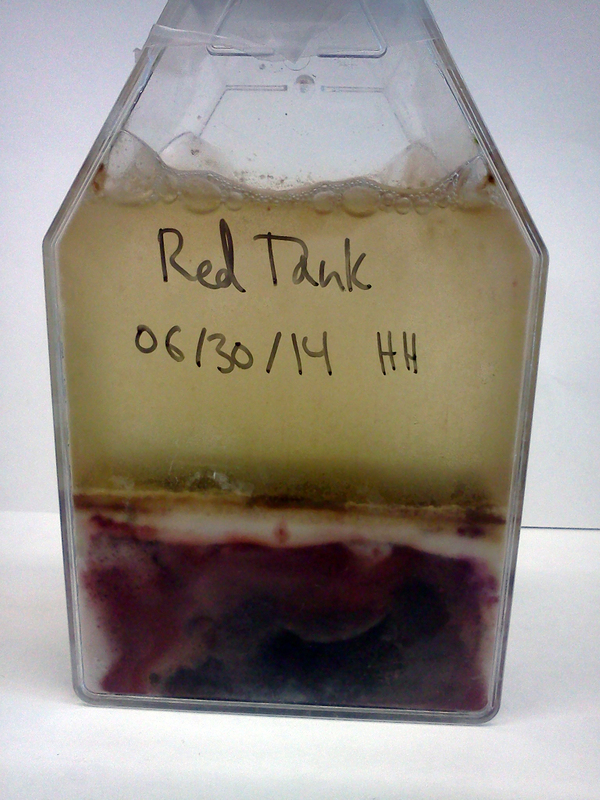 It has been three weeks since we last shared with you our Winograsky column progress. If in that time you’ve forgotten what a Winogradsky column is and our goals for them I urge you to visit: Adventures with Winogradskies and Further Adventures with Winogradskies to refresh your memory. We are finally starting to see some pretty pink layers! 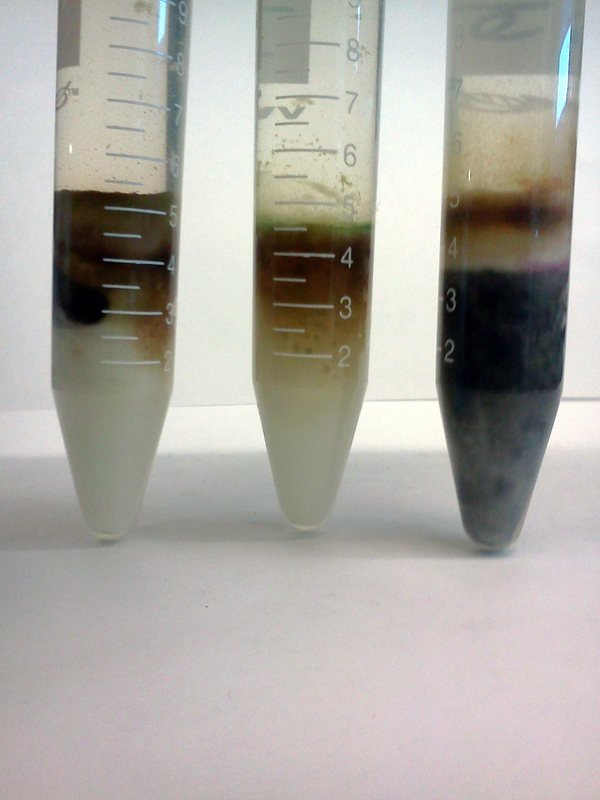 Many of the darker colored bacteria from week 4 are gone from these columns… could it be that our columns are undergoing microbial succession?? 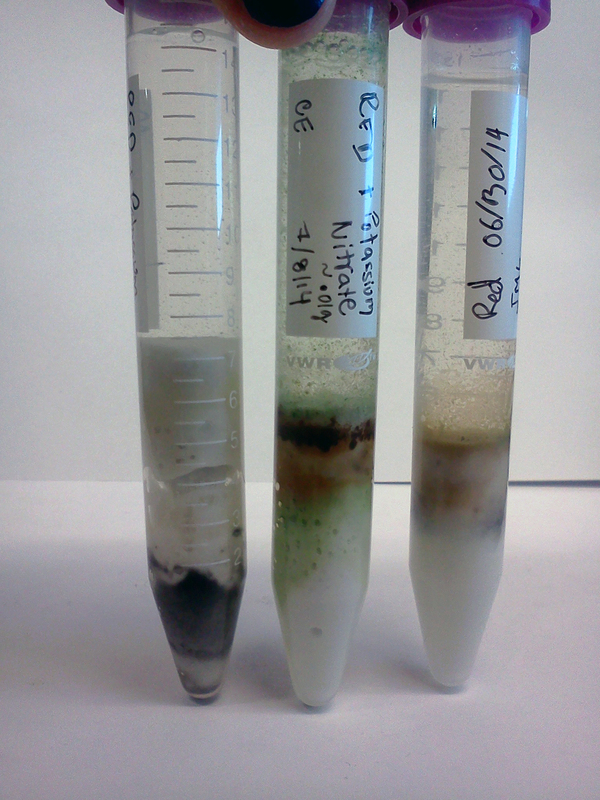 Could Winograsky columns be a good model system for studying microbial succession? Strangely (or not so strangely? ), it is our large containers that show the most variation between replicates from the same sample location. 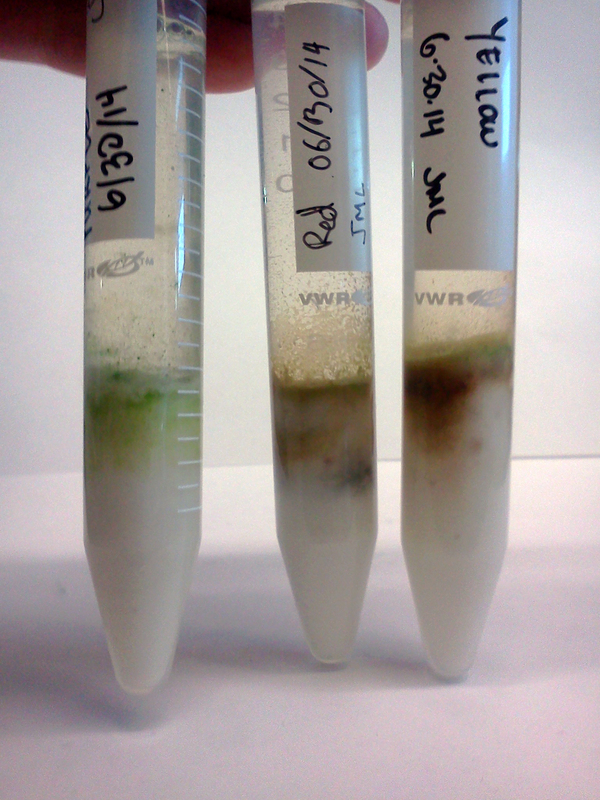 We have everything from green-as-grass and pretty-in-pink to black-as-coal microbes. 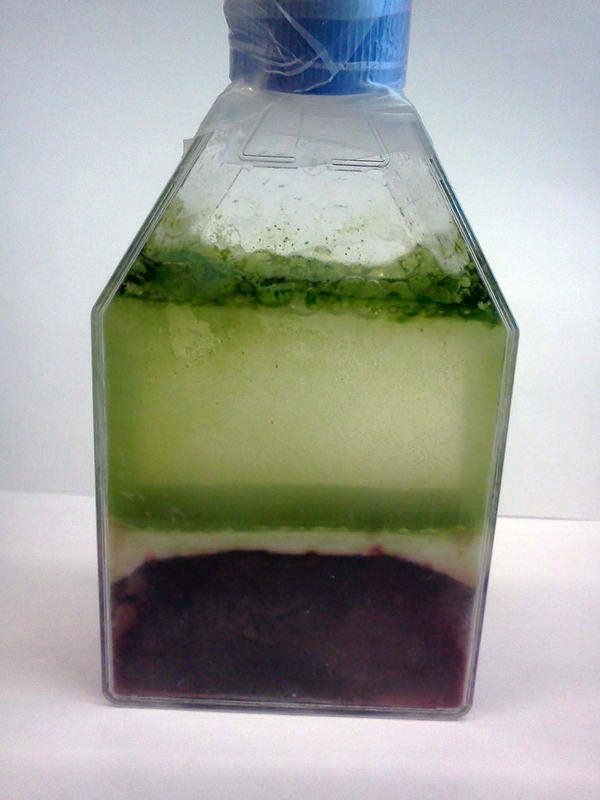 The container above on the far right is the one that we’ve been simulating soil conditions in by covering the bottom half of the container – could the lack of pink and purple microbes be due to this? Above you can see the variation in vials taken from different sampling locations. 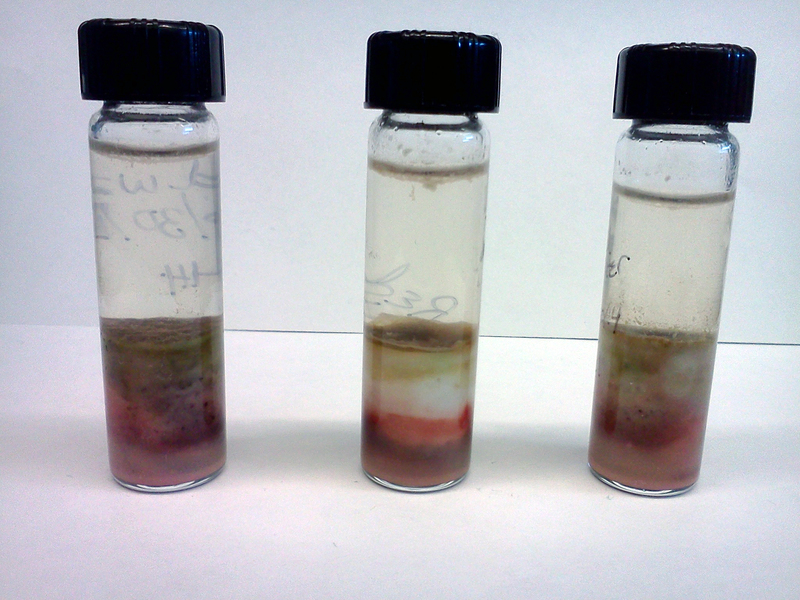 The microbes in these vials seem to be growing at a slower pace than those in the large container – we also see this with our small micro-centrifuge tubes (not pictured) which haven’t changed significantly form week 4. 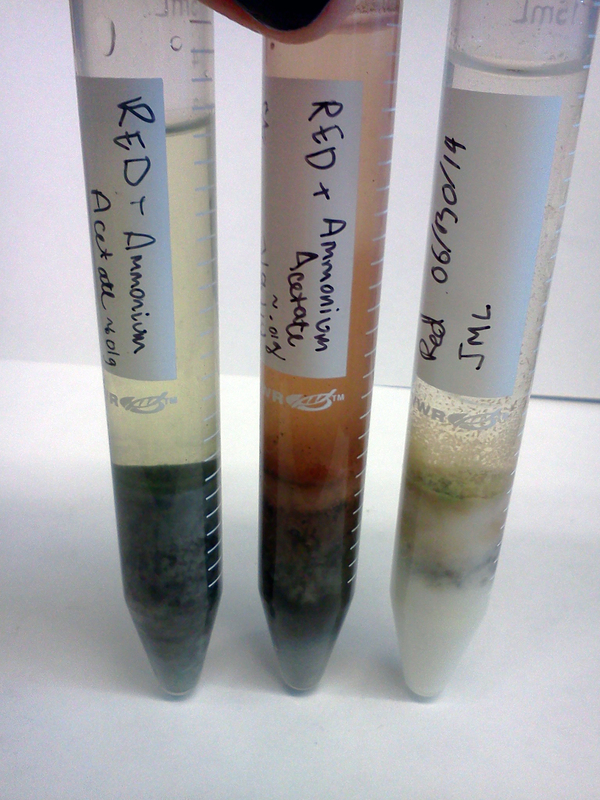 On the left are the tubes we added Potassium Nitrate too and on the right are the tubes we added Ammonium Acetate too. 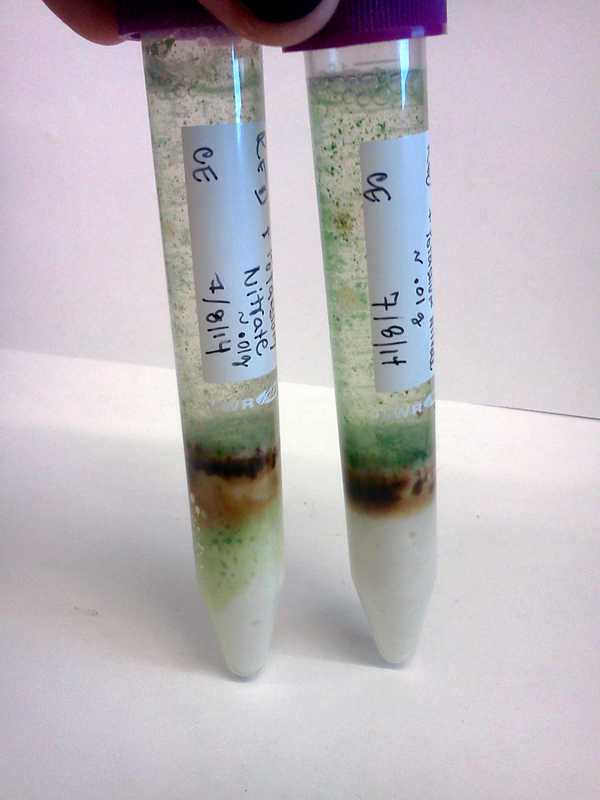 The Potassium Nitrate tubes have green microbes growing in firework like patterns up the sides of the tubes! 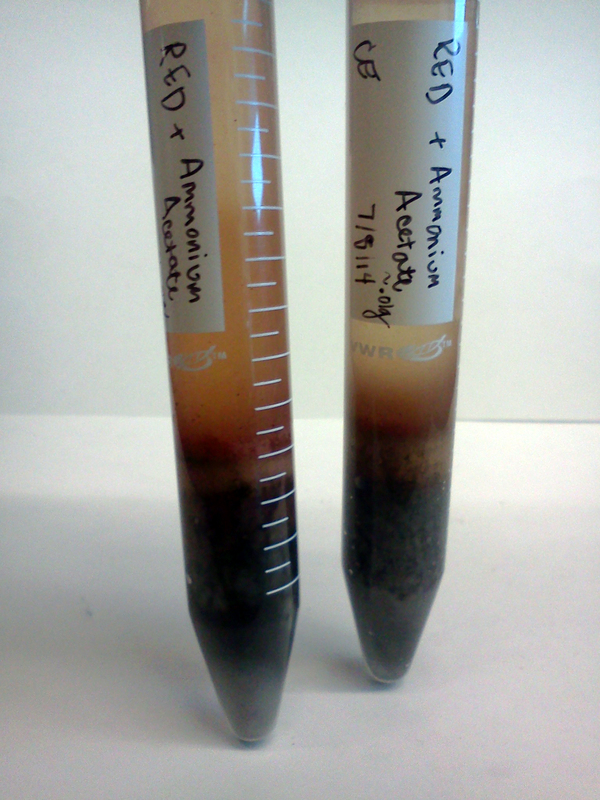 The Ammonium Acetate tubes have pinkish-brown microbes clouding them up! It is amazing how different the Potassium Nitrate and Ammonium Acetate tubes are given that they came from the same original sample! The two above tubes were kept in the dark via aluminum foil. 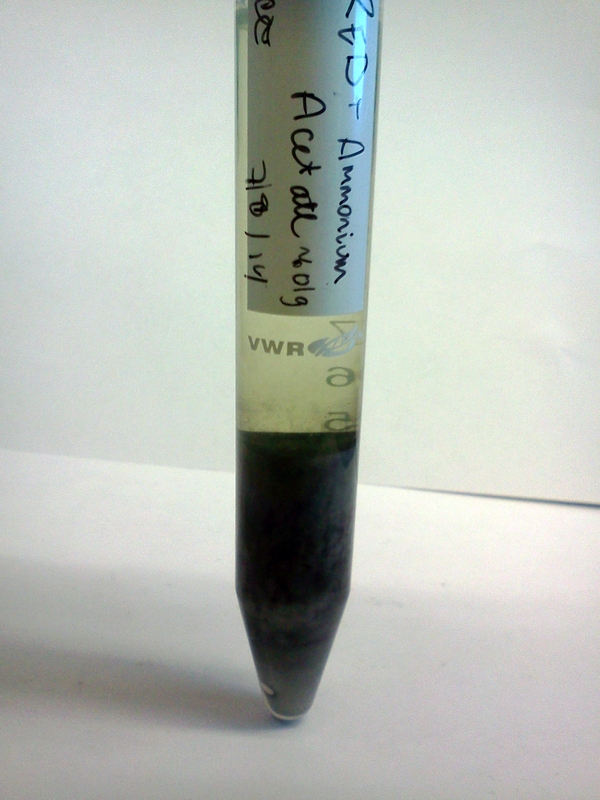 The left tube has had Potassium Nitrate added to it and the right tube has had Ammonium Acetate added. 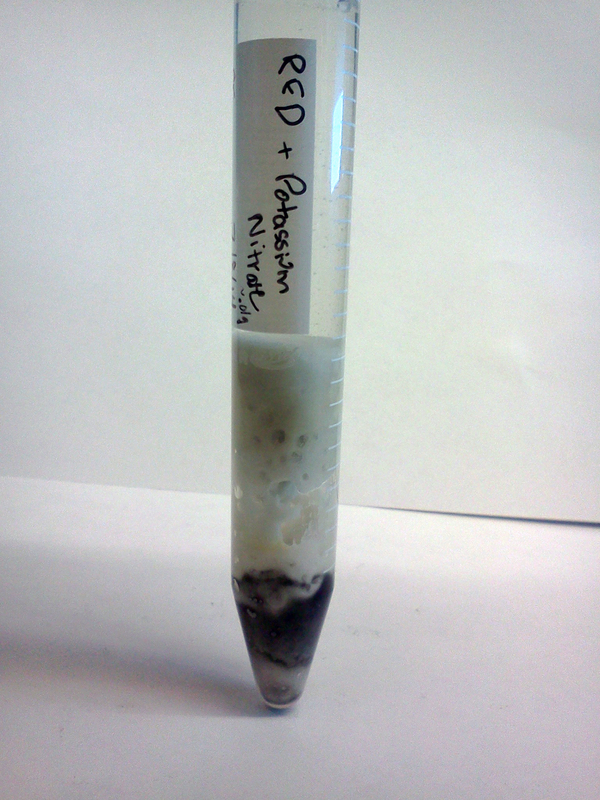 It is hard to see but the Potassium Nitrate tube has a lot of gas bubbles in the diatomaceous earth in the bottom of the column. The differences between the different treatments (light with chemical vs. dark with chemical vs. no chemical ) is most significant when you observe the tubes right next to each other. It will be interesting to investigate the community composition differences between all these tubes! I wonder what types of communities we’d see with different pH’s, salt concentrations or other added chemicals… Until next time, stay tuned! It has been the privilege for the Eisen lab to host Henna Hundal, a high school senior, radio show host and soon-to-be certified yoga instructor, on a six-week summer research project. Henna was part of UC Davis’ prestigious Young Scholars Program. For the wet lab portion of Henna’s project, she focused on the Seagrass Microbiome which involved growing and isolating microbes from seawater on LB that she helped collect from tanks of Zostera marina at Bodega Bay. 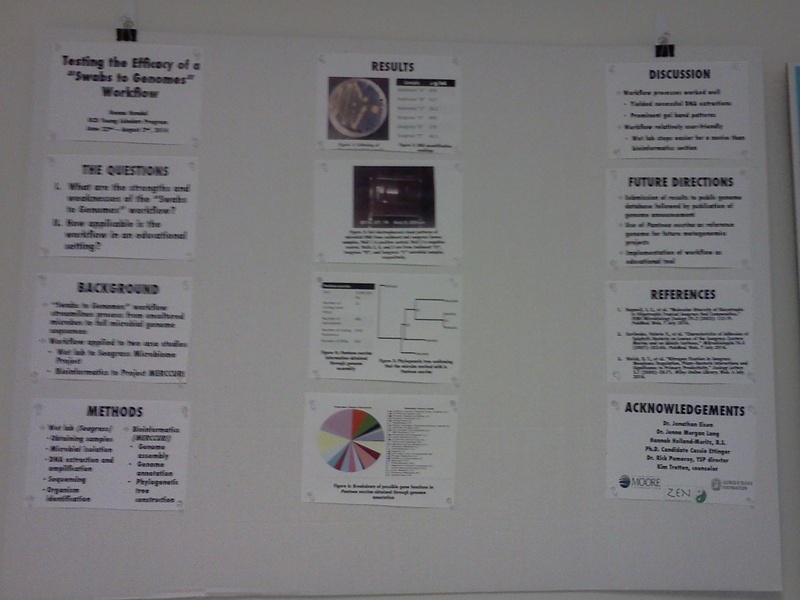 As part of the Young Scholar’s Program, Henna had to make a scientific poster of her intended project, write a 10-30 page final paper and give a 10 minute presentation on her project. For extra credit (because Henna was magnificently studious) she also turned her powerpoint presentation into a makeshift poster. The best explanation of Henna’s summer project was the one that Henna gave herself. As an experienced radio show host, Henna was a natural presenter. Henna’s final presentation was recorded and can be viewed: HERE. As a whole, we are unbelievably proud of the work that Henna did while in the lab and would be happy to have her back anytime! She is an amazing young scientist and effective science communicator and we have no doubt about her future success! So congratulations Henna on being made of awesome!